Tayport Community Trust exists to develop sustainable activities for the people of Tayport in North-East Fife. Initial discussions were held with the Community Trust’s development worker, and proposals produced giving the pros and cons of both static (HTML) and dynamic (WordPress) websites. Because the development worker was familiar with HTML and would be able to maintain the site himself, the static site option was chosen. In terms of design, local photography was used to produce the header and background images. Blue and sand colours were chosen to compliment Tayport’s coastal setting. 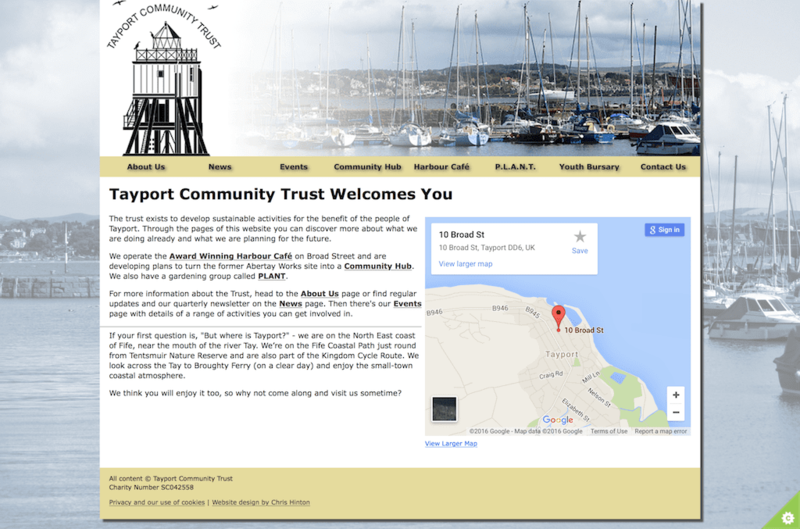 Once the site was approved, it was uploaded to Tayport Community Trust’s web host and made live to the world. Initial updates were carried out by Chris Hinton, before eventually handing the site entirely over to the Trust. To explore the site further, visit Tayport Community Trust online.